And yet, it’s super fun. The story is silly but also classic comic book fare, with an evil cabal, a master plan, and lots of fun twists. But it’s filled with awesome action sequences and some really incredible art, especially the Incredible Hulks series, drawn by Paul Pelletier of Marvel Cosmic fame (Annihilation: Conquest and War of Kings). Fall of the Hulks starts off relatively slow and somewhat confusing. 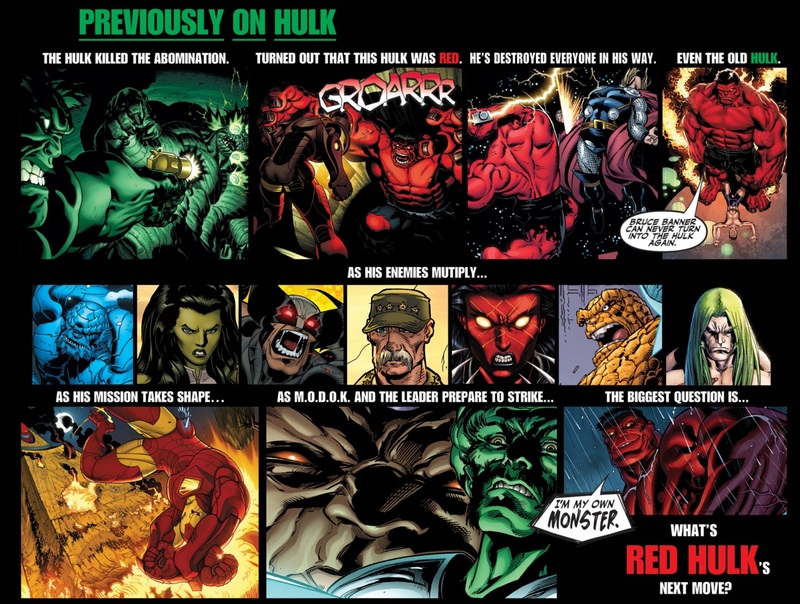 Even as someone that had been reading both main Hulk-related series, I was a bit lost as to how Red Hulk was involved and where his allegiances and motivations lie. 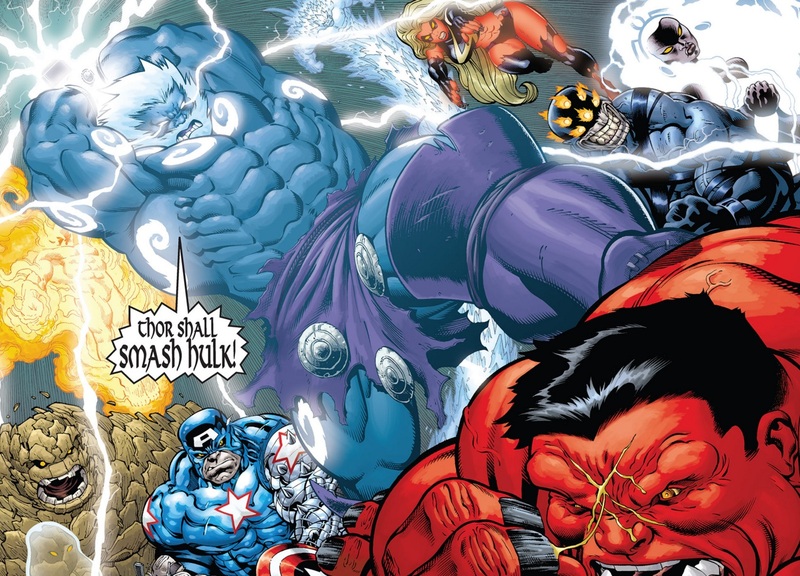 To attempt to simplify things: Red Hulk starts out as a grudging member of the Intelligencia, a cabal of evil villains lead by MODOK, Doc Samson, and The Leader, along with some D-list villains like The Wizard and Red Ghost. 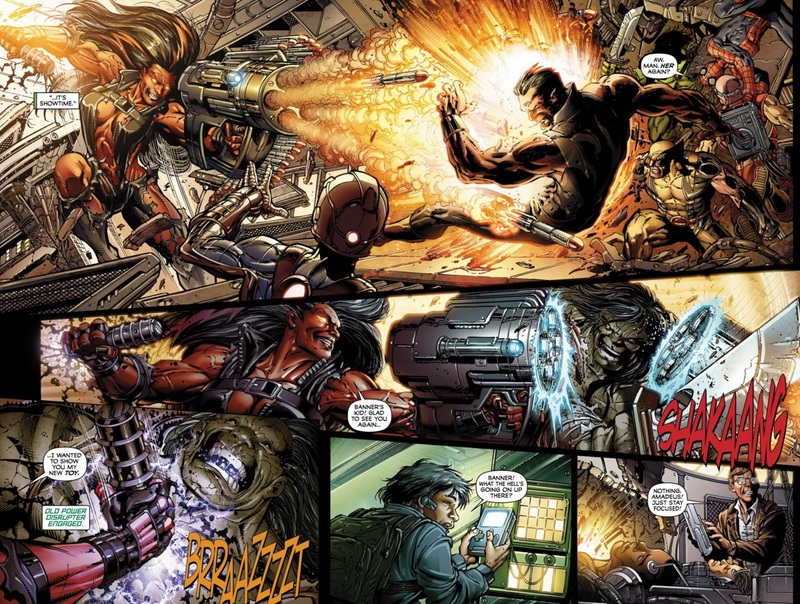 Hulk does not exactly have a great rogue’s gallery, and the Abomination was actually murdered by Red Hulk back in the opening issue of his series. In the lead up to Fall of the Hulks, Red Hulk gets a fun crossover with X-Force. Well, not technically a crossover as it’s solely within Hulk’s series, but it’s a lot of fun – Wolverine scratches Red Hulk’s eyes out, blinding him! It also introduces a vicious and powerful Red She-Hulk, who’s identity is also shrouded in mystery. Meanwhile a few months before Fall of the Hulks, a new Incredible Hulks series begins. The series stars the odd father-son team-up of a Hulk-less Bruce Banner and his half-alien son Skaar. Since Red Hulk beat Hulk and siphoned off his power several issues ago, Banner can’t transform any more. Skaar wants to kill his father for leaving him in a hellhole on Sakaar. Thus we get a few issues of Banner training Skaar, including random guest stars Juggernaut and a fellow father-son team of Wolverine and Daken. It eventually comes to light that the Intelligencia (an embarrassingly bad/awesome name for an evil team-up) created Red Hulk and later, Red She-Hulk. Red Hulk soon starts working his own agenda, and I’ll be damned if Jeph Loeb doesn’t find make him a compelling character. I was mostly uninterested in Red Hulk throughout his first 12-issue volume. A new inner monologue and more thoughtful process improves the character immeasurably. The Intelligencia’s first task is to capture all the smartest people in the world (which I was quick to notice, are all men) and drain their brain power, eventually siphoning it into MODOK. The main story of Fall of the Hulks involves their capture of Reed Richards, Hank Pym, T’Challa, and Hank McCoy, which is a great excuse to involve the Fantastic Four, Avengers, and X-Men. 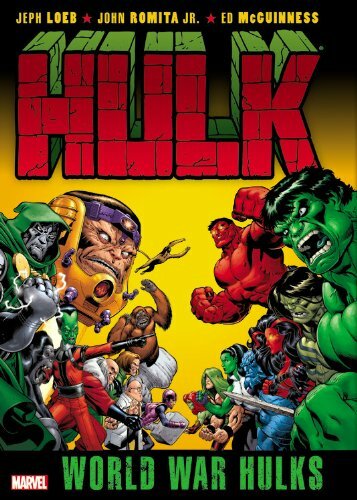 The story flips back and forth between Red Hulks’ point of view in Hulk, and Banner’s point of view in Incredible Hulks. It’s far from seamless – unlike say Messiah Complex which ordered each of its four crossover series into chapters. Here you have to either look up a reading order, or go by publication date. It gets even more confusing with the limited series Fall of the Hulks: Red Hulk, which gives additional backstory on Red Hulk and his relationship with the bad guys. Then there’s a very tangential addition of the Savage She-Hulk. That would be Bruce Banner’s daughter from a War of the Sexes-style future with super-powered amazon women. It’s dumb and Lyra is a minor side character at best. But the action is fun, and it bleeds into World War Hulks pretty well. Ironically the original She-Hulk, Jennifer Walters, would be side-lined for much of this entire gamma-powered arc. Even with a reading order the events get muddled and confusing. Provided you don’t try to dive too far into the actual Whys and Hows of the story and focus on the action and characters in each moment, it’s quite the ride. The explosive battle on the Intellgencia’s helicarrier makes up the entire setpiece for World War Hulks. The cabal’s plan goes off as they’re able to harness gamma and cosmic rays to produce their own hulk-army. It also has the side effect of hulking out every hero in the area, leading to some really silly, yet crazy fun battles. Again the art really shines here as the interpretation of each hero’s hulk form is quite brilliant – Thor resembles a D&D Cloud Giant, Wolverine looks like a hairy shadow demon, and Cyclops gets big glowing eyes all over his head. The best part of the story is that our characters actually grow, and their situations change dramatically. 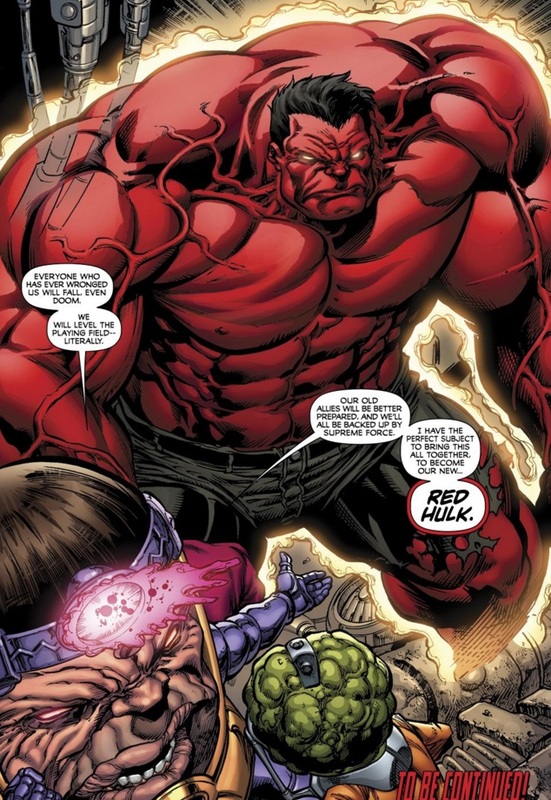 In Hulk, Red Hulk is stunningly revealed to be Thunderbolt Ross, Banner’s old army General nemesis, and Red She-Hulk his daughter and Bruce’s wife, Betty Ross. The fact that Marvel kept this under wraps for nearly two years is impressive. The reveal takes an entire issue to explain how it all came together, and I found it decently satisfying. At the end Red Hulk fights back against the Intelligencia, and in a weakened state is finally captured by the Avengers. Since his title was selling very well at the time, not only does it continue, but he gets a spot on an Avengers team! Grek Pak’s Incredible Hulk run also gets a satisfying conclusion to the Skaar arc. At the end of World War Hulks, all that gamma energy has to go somewhere, and Banner knows he’s the only one that can absorb it. He’s transformed into the Hulk again, finally, and Skaar siezes his chance to fight and kill him. The battle is an amazing knock-down drag-out fight that takes place over an entire issue. Pak infuses just the right amount of action and gravitas with the emotional punch of a kid who had an abusive father, now realizing he’s fighting his own son. In the end, father and son embrace, and it feels earned. I might’ve choked up a bit. I really wish the story arc had utilized a better order and numbering system to make reading easier. It’s a really fun experience and a great way to mash all these old and new gamma-powered heroes together for some big battles and emotional gut punches. Even if you know nothing of Red Hulk or Skaar or A-Bomb, both arcs tell a complete and satisfying story, with some truly amazing artwork.